A Yorkshire company that owned a hotel in Cornwall which was destroyed by fire in 2007 has admitted two charges of failing to meet fire safety standards. 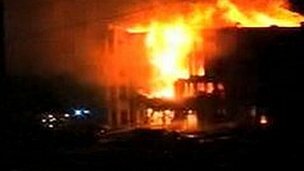 Three people died as a result of the fire at the Penhallow Hotel in Newquay. O&C Holdsworth Ltd admitted at failing to provide proper fire detection and alarm systems and failing to make a proper risk assessment. Two employees, who pleaded not guilty to similar charges, were discharged by the judge at Truro Crown Court. The company, which admitted the charges brought by Cornwall Fire & Rescue Service and Cornwall Council, is to be sentenced in May. The two senior Holdsworth staff, John McMillan and Nichola Burfitt, denied six offences. Their pleas were accepted by the prosecution. The fire broke out on 18 August 2007. Flames reached 30ft (9m) into the sky and the building, in Island Crescent in the town, was later demolished as result of the damage. The fire, which was fought by more more than 100 firefighters, was described as the worst in the UK for nearly 40 years. About 90 people managed to escape from the 54-bedroom hotel, but Joan Harper, 80; Monica Hughes, 86; and her 43-year-old son, Peter - all from Staffordshire - died as a result of the fire. Mr Hughes, a teacher from Cheslyn Hay, jumped from the third floor of the hotel after trying in vain to save his mother but died in hospital. 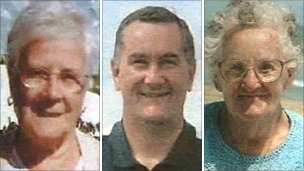 An inquest into their deaths held last year returned an open verdict. It heard that the fire was believed to have started in a hotel bar drink store and spread to the rest of the building. Investigators could not say for sure what had caused the blaze, although evidence given during the inquest suggested it had been started deliberately. After the case, John Hughes - brother of Peter and son of Monica - welcomed the pleas, saying his family had been through "absolute hell" since the fire. He said: "To lose two members of your family is beyond most people's imagination. "The best thing that could come out of this is that the tourism agencies and hotels sit up and take note. There are still premises and hotels around the country that are not complying with fire regulations." Cornwall Council said it welcomed the guilty plea. Judge Christopher Elwen adjourned sentencing of the company, based in Halifax, West Yorkshire, until May.